Westlake, Ohio – June 7, 2016 – For the second consecutive year, Budget Dumpster has been selected as one of the largest waste companies in North America by Waste360. 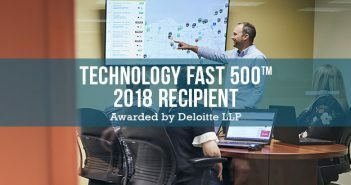 Widely regarded in the industry, the Waste360 Waste100 ranks the largest waste and recycling firms in North America based on 2015 revenues. 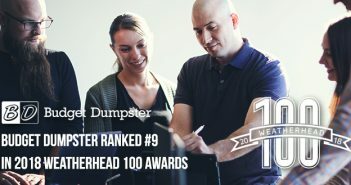 Moving up 10 spots to 67, Budget Dumpster continued to strengthen the business in 2015 by solidifying key business relationships and expanding into new markets. Campbell and John Fenn co-founded the organization to disrupt a waste industry niche – temporary roll-off dumpsters – in 2009. Since their first year, the company has seen double-digit annual revenue growth, including 45% growth in 2015 and 40% growth through Q1 2016. Established in 2009, Budget Dumpster delivers affordable waste removal services in in 44 states and most major markets throughout the United States. Working with over 250 local partners, Budget Dumpster sells thousands of temporary roll-off dumpsters each week for projects big and small. 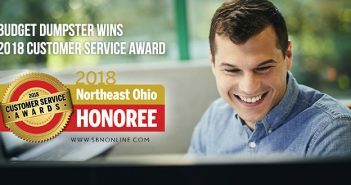 Based in suburban Cleveland with a growing team of over 60 employees, Budget Dumpster has been recognized as one of America’s fastest growing companies by the Inc. 500 (#966 in 2015), one of the top five fastest growing companies in Northeast Ohio by Crain’s (2015), and one of Fortune’s Most Flexible Workplaces (2016). Learn more about how we help people and companies each day at www.budgetdumpster.com.